Zaragoza: grey, rain-covered sky. For the opening ceremony this promises nothing good. 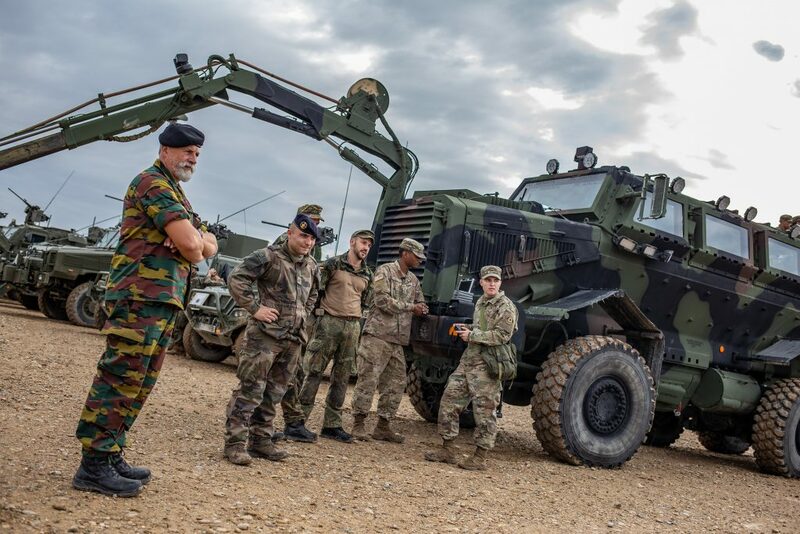 Nine hundred soldiers from 12 nations are standing on loamy brown ground, while the head of the Eurocorps staff, Major General Fernando Garcia Blazquez, is taking over the formation and formally opening EURETEX 2018 (EURETEX=EURocorps Engineer Training EXercise). In his speech, he immediately makes it clear what is important in this exercise: Interoperability. Soldiers will use this opportunity in the next few days, because unlike many other exercises, EURETEX 2018 is a kind of test laboratory. Sappers, i.e. 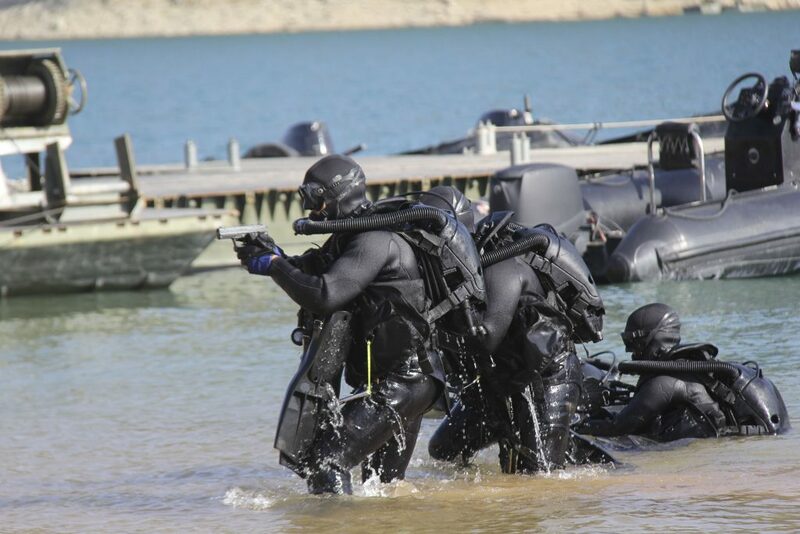 pioneers in direct combat support, members of the Explosive Ordnance Disposal (EOD), divers, CBRN Defence (Chemical, Biological, Radiological and Nuclear), the Military Geographical Service and the “weathermen” can train and try out together for a week. 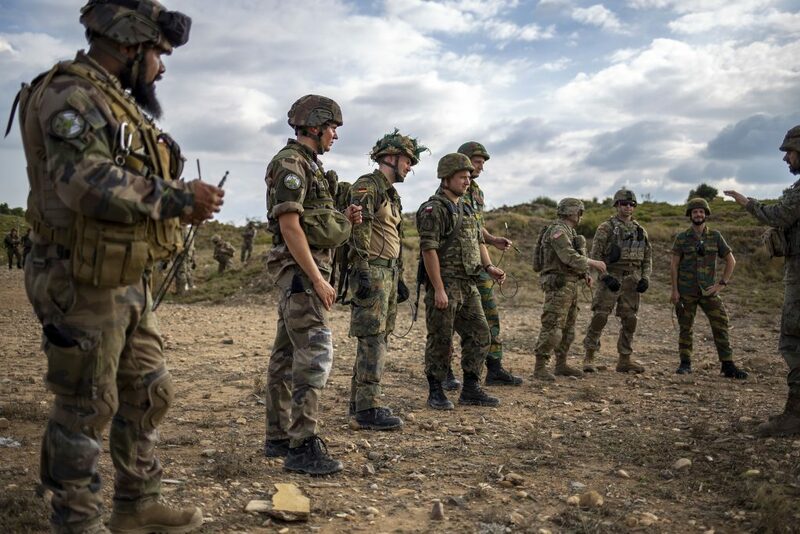 The training is not centrally defined, but can be determined by the host nation and in particular by the wishes of the participating soldiers. This is exactly what makes it so attractive for the troops. Eurocorps launched this pioneering exercise back in 1996. Since then, it has taken place approximately every two years, depending on the rhythm of the Eurocorps’ operations. This year, Spain had agreed to act as host nation. The San Gregorio training area is located north of the city of Zaragoza. 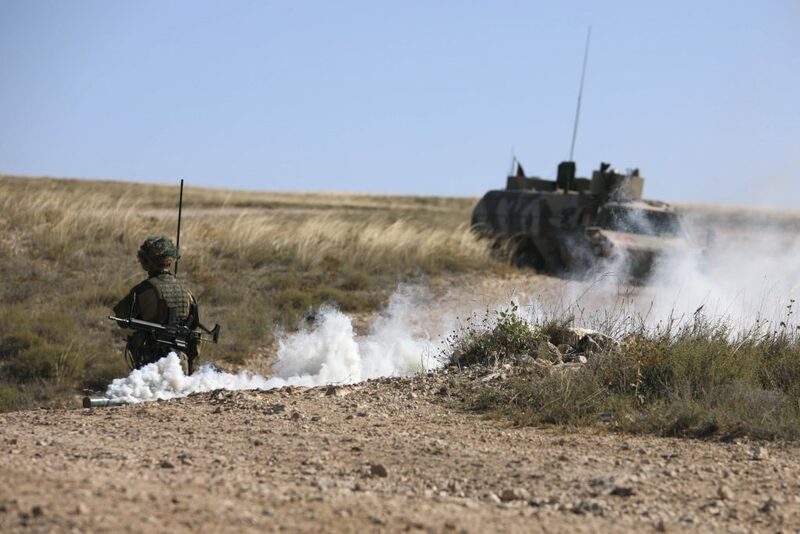 It is one of the largest military training areas in Europe and, due to its relief, a dream come true for all tank drivers, as dozens of kilometres can be driven in any direction and at the same time the movements are not disturbed by trees or buildings. The starting point for the troops is a living area, a kind of container settlement, which could also be used in many areas, even if the occupancy rate of three to nine soldiers deviates slightly from the German specifications. On the following days the weather also shows that it wants to support the exercise of the pioneers. With a bright blue sky and daytime temperatures of around 20 degrees, it was easy for the pioneers to drive out. All the more as the mixture of weather and relief reminds more than one soldier of Afghanistan. So you can also train close to the field. The main areas used are the Casas Altas area (training area for urban operations), the blasting ground (approved for up to 1,000 kg net explosive mass), the military railway station and a discarded building complex, which in earlier times was used as a hospital with horse stables. First compulsory date for all those involved with explosives: The central briefing. 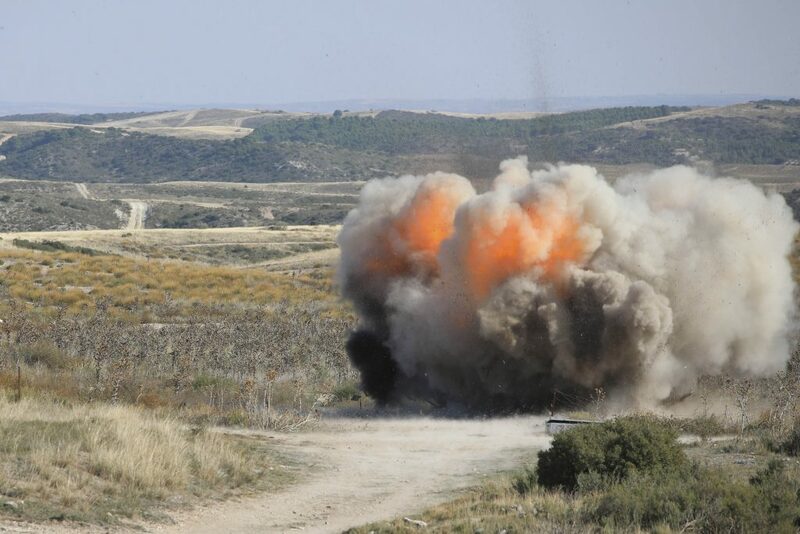 Since the transport of explosives would have been too expensive, Spain provides the explosives. That means for all parties involved a briefing on the Spanish explosives and detonators. Only then can the Sappers and the members of the EOD really get started. Whatever happens then! 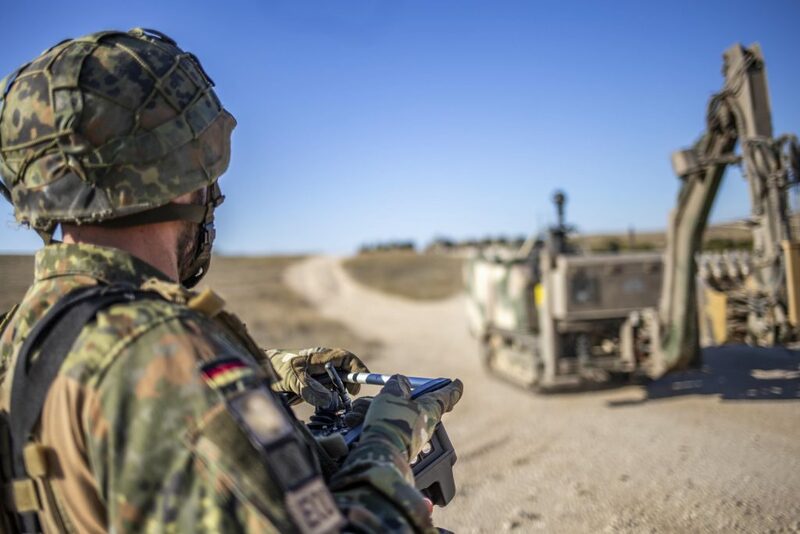 In addition to the use of explosives to penetrate a house, the EOD´ler use smaller quantities to clear mines and Improvised Explosive Devices (IED). The highlight was the demolition of a car wreck. Three road clearance systems were also on site. While the American and Spanish soldiers used the US American system and exchanged information about it, the comrades from Bogen had the German and thus the only remote-controlled system on site. “While “Buddel” and his companion enjoyed great interest, they also made it clear why mutual knowledge is so important compared to their US counterparts: while the German system is much more thorough but also slower, the American system is faster, less accurate and manned. So, despite all the protection, soldiers are always at risk. Especially for military leaders it is important to know the deployment possibilities with all their advantages and disadvantages, but also the differences in the tactical deployment principles, in order to adequately prepare, plan and ultimately carry out multinational operations. Less known, because smaller group: the members of the Military Geographical and Meteorological Service. 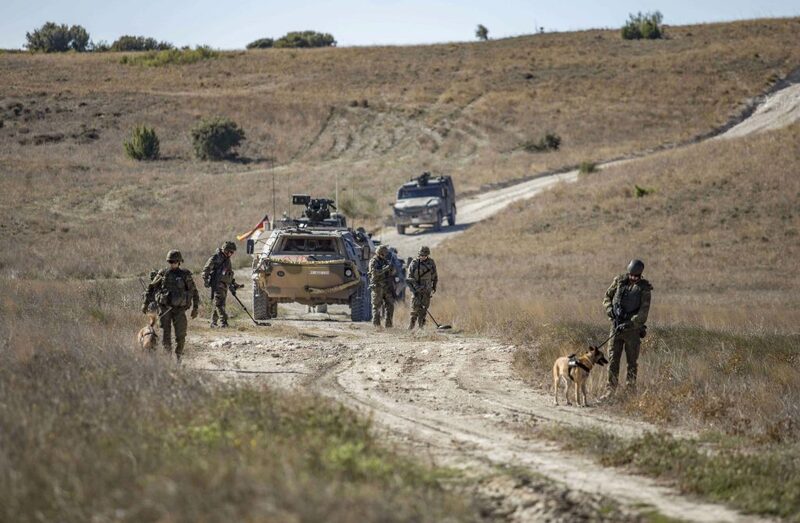 Although of great importance especially in the missions, the soldiers of these areas have hardly any opportunities for multinational exchange outside EURETEX. All the more reason for them to seize the opportunity in Spain. A special highlight was the brand new surveying device on the German side. Similar to “google streetview”, high-precision 3D maps can be produced with this device. The attachment looks like a state-of-the-art roof rack and can also be mounted on protected vehicles. The speed is sensational: Where French and Spanish comrades spend almost a day with a surveying team, this vehicle only takes a few minutes. This led to more than an envious look. 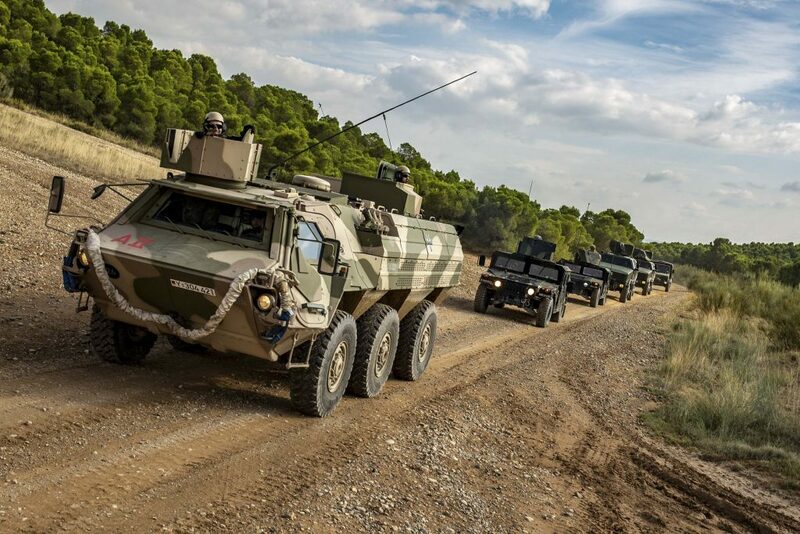 The examples can be continued at will for construction pioneers, here from France and Spain, water treatment, power generation and the full range of CBRN. All activities are geared to the needs of today’s battlefield. The spectrum ranges from the construction of a fully equipped, protected command post supplied with electricity and water (which will continue to operate even after the end of EURETEX), to activities required in foreign missions, such as water treatment, counter-IED and field camp construction, to defence against terrorist threats. 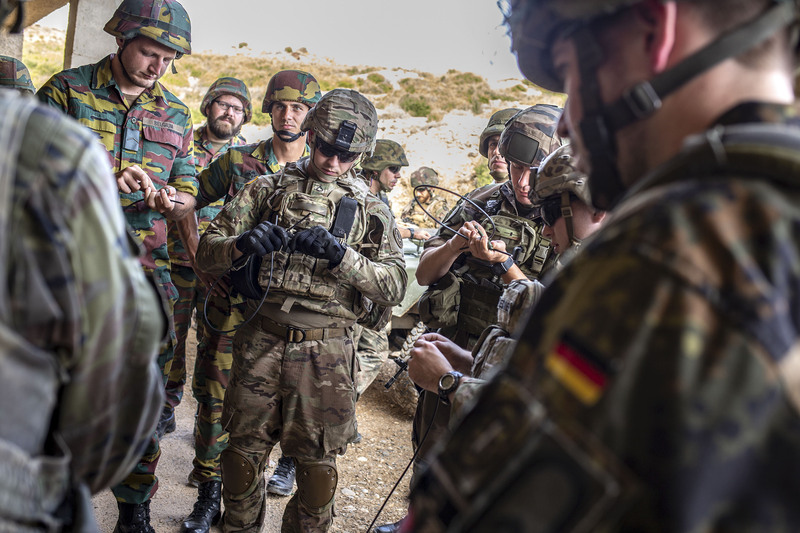 The latter in particular is an issue which many European partners regard as a matter for the military and which is dealt with by specialised forces. The exercise scenarios are correspondingly diverse. They all have in common: interoperability, multinationality and camaraderie were deepened in this short week. The cooperation and discussions continued in the evening in the “Cantina” and contacts were made. The good weather lasted until the final exercise and ceremony. Under a cloudless sky, all areas showed a selected international audience what they could do and how they had trained together over the past few days. Among them was the actual “host” of the exercise, Lieutenant General Jürgen Weigt, Commanding General of the Eurocorps. He underlines the value of this exercise, which goes far beyond the normal pioneering craft: “This exercise is unique even when NATO is taken into account. Here, skills are trained that are more important than ever in today’s modern battlefield and in a multinational environment”. At the following closing ceremony his conclusion is: “Mission accomplished”. Where the next EURETEX will take place has not yet been finalised. Nevertheless, all participants agree that EURETEX is a unique experience which will be continued in any case. The British comrades involved sum it up for many: “Interoperability” of its finest!